I wasn’t sure this was going up tonight but here we are. 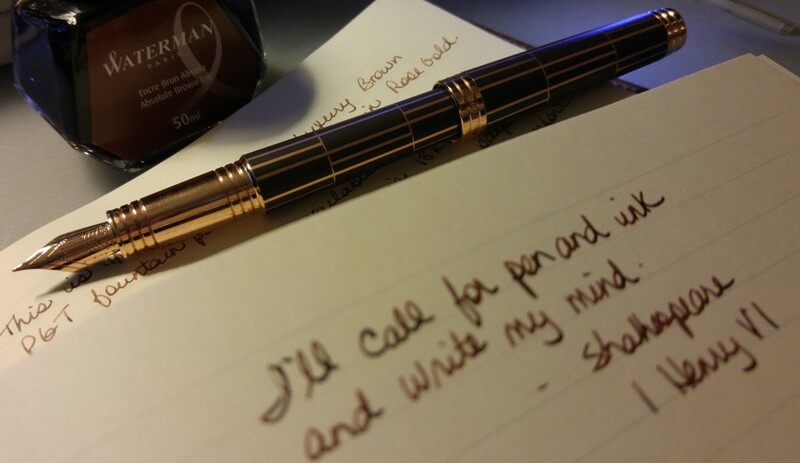 It’s been almost a year since my last post and I’ve been wanting to get writing again for a while now. What better time than the first day of a brand new year? 2017 was a hard, frustrating but ultimately magical year for me. I’m happy to report that my health is vastly improved and my new life in Nova Scotia is settling down wonderfully. I don’t know for how much longer I will be able to get away with being “new”; in May it will be two years since we moved here. I think the “new” is wearing thin. But that’s ok because with each passing day I feel more and more connected to my present space in the universe. And more and more thankful for the opportunity to shine. My plan for the blog is simple: 52 posts for 2018, one for each Sunday in the calendar. I am still in love with journals and stationery and fountain pens; I still have something to say about them. But when I was blogging somewhat regularly in 2016 I found myself buying items not because I loved them but because I was running out of things to talk about on the blog. I have beautiful pens and notebooks that I’ve used for years; I want to celebrate them. So the new items may be few and far between. I can’t tell you more than that what the new format will look like because I’m still figuring that out. Hopefully it will be of interest for those of you who still visit this space; thank you for sticking with me. I hope 2018 is a great year for all of us. I’m looking forward to journaling my way through it. Welcome back. I am finding my way back to my blog too. Look forward to following you. Have a great 2018. Isn’t it interesting how we are drawn back to our blogs? Looking forward to continuing the journey with you. Welcome back and Happy New Year. I too have had some time away from blogging for health reasons and I am still here and recovering. I look forward to reading your posts and chatting about pens. I recently discovered a new one, which became a wonderful favourite. Thank you Julie. I am glad you are recovering and I hope that continues. Happy for you that you discovered a new favourite! Happy New Year! It’s wonderful to see you back and to hear that your recovery has gone well. All the best in 2018 and I look forward to reading your blog. Thank you very much Susan, all the best to you as well. Welcome back, and Happy New Year! I love your idea of blogging every Sunday in 2018 – and I look forward to each and every one! 2018 will be a wonderful year. It will indeed. Thank you! Thank you teabird! It’s nice to be back. Welcome back, and hope you have an equally wonderful 2018! If you’ve long enjoyed something, then you’ll know something about it. And I for one, am looking forward to reading what you have to say. Thank you Paul, it’s lovely to be supported. Happy New Year! I am so very happy to hear that your health has vastly improved. After all, what/where are we without our health? Nice to have you back Heather. Happy to hear that your health has improved and I look forward to reading your new blog posts. Wishing you a wonderful New Year filled with love, joy, peace, health, prosperity and writing, which necessitates lots of pens and journals/notebooks. Thank you Cheryl, I wish the same for you and yours. Looking forward to the writing! Happy New Year. You write I’ll read. Deal! Happy New Year to you as well. Welcome back. I’m so glad things are going so well for you. Keep smiling. Thank you Melinda, it’s good to be back! Thank you Florence, Happy New Year to you as well. Welcome back, Heather. Looking forward to reading your posts. Thanks Dianne, good to be back! Nice to see you back! And I agree, I am more interested in what you think than what you buy. Thank you Carla! It’s good to be back.